Today's post isn't wordless because it requires a bit of a set up. You see, we go through a lot of mustard at our house so Mommy buys it at the dollar store in the largest size they offer. She hates the plastic squeeze bottles though so she transfers it into a glass jar. I decided to snoopervise the process and didn't know quite what to make of it. The look on my face as I watched the mustard plop into the jar cracked Mommy up. Do your humans ever do things that perplex you? I guess mustard does weird things when it's not on food. We gave up trying to figure out humans. Does watching it make it go faster, Mudpie? MOL!!! Your expression is fabulous! Your expression is too funny! MOLMOLMOL! We get that look when snacking on fruits or veggies, and the kitties take a sniff to see what we're eating. They look at us like they are disgusted that we would eat such a thing! Our human perplexes us everyday! Miss Mudpie we just love the expression on your face! That look is priceless! MOL! 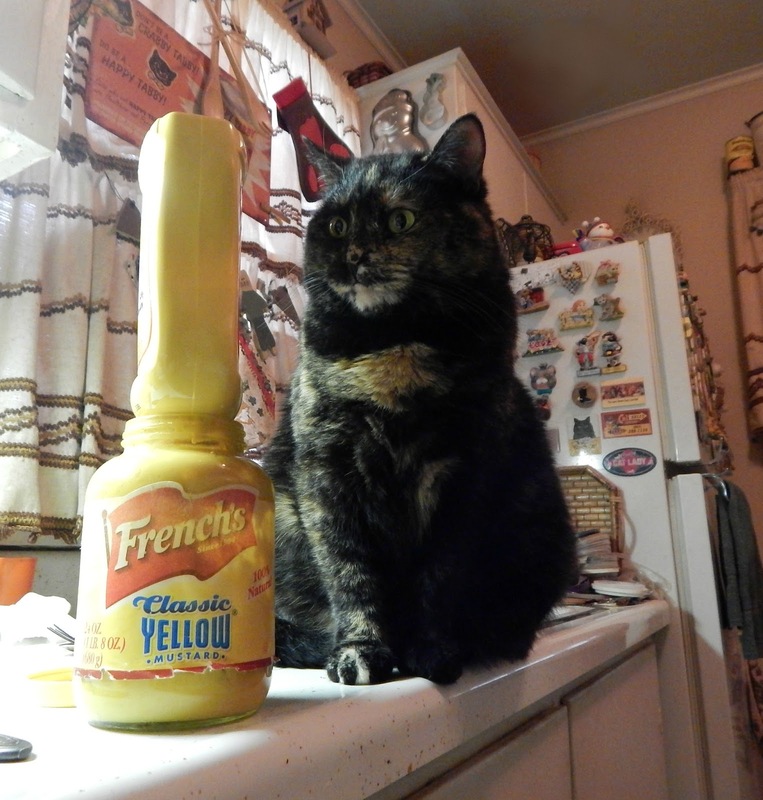 Curse French's and their strange mustard!!! How dare they purrrr-plex you! MOL! Mudpie, you have such adorable expressions. I'm glad that your mommy has you to keep her in line. I'm pretty sure that I regularly baffle my kitties. They have no idea why I would intentionally go in the shower and just stay in there a while. They yell at me the whole time. MOL, Mudpie! You're look definitely says it all! Mommy perplexes us every day. i LOVE that expression! Pretty much the way Amarula looks at Frodo most of the time! What an expression! Did you tell that mustard to make that sound only in the litterbox? Nothing like having some good ole fashion yellow mustard in the house. So funny ! The way cats react to small things in daily life is great fun ! HAH! The look on your face!!! That big jar looks bigger than the squeeze bottle. Pop uses mustard the 3 times a year we have hotdogs. TW sometimes makes chicken with honey mustard dipping sauce. Other than that, we're a mayo family. Daddy has to keep a sharp eye on Friday as she likes to try to help in the kitchen. He especially watches out when he has the oven open. That expression is truly priceless. I wonder what in the world she is thinking. My cats look at me like that when I'm sweeping. For some reason, they think sweeping is the most pointless activity ever, and they can't understand why I keep doing it.